The Billionty-Oneth Geek: The Karate Kid!!!!!! First thing's first. When the trailers first came out late last year, it boggled my mind. First of all, the movie is called Karate Kid... karate... a Japanese style of martial arts, which would be fine except that the movie seemingly took place in China. So, okay, I thought, maybe they would relate to karate in someway during the movie... yet during the trailer, all they talked about was Kung Fu (the Chinese form of martial arts). Uh, brain, are you there, hello? So unfortunately, there is no explanation (at least in context of the movie) of why they called it Karate Kid. The kid learns kung fu and all they talk about is kung fu. 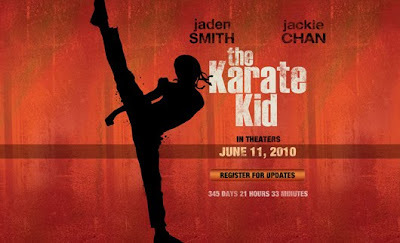 As I watched the movie, I thought they'd throw in a joke about karate, but none would be had. As I recall, the word karate wasn't even used once. So in conclusion, it was just a business maneuver to capture that nostalgia market. I mean, would it be a stretch to call the movie "Kung Fu Kid". I'm sure that the nostalgic demographic could of made the connection. But I digress. This movie is a remake of the 80's hit starring Will Smith's son, Jaden, in Ralph Macchio's role and Jackie Chan in Pat Morita's role. I didn't have high hopes going in, so it's probably why I was surprised when I found myself enjoying it. By no means was this a great movie, but it was still entertaining. I guess it wasn't hard given that they pretty much followed the original Karate Kid story point by point... except for the kung fu part... and the kid is black... and it takes place in China. Other than that, it's basically the original Karate Kid movie. They even updated the scene where Ralph Macchio takes Elizabeth Shue to an arcade... AN ARCADE! Anyhow, I don't think there's any point in getting to the story. If you've seen the original movie, then you know what you're in for. The fighting scenes were fun, especially in the final act at the fight tournament. And like in Iron Man 2, we get to see some lucha libre moves! I don't think it's even possible to pull off one of these moves on someone in real life, but alas, it's lucha libre, so I can suspend my beliefs. There's nothing more fun than watching fights where people can spin around on someone's head. It's not kung fun and it's definitely not karate, but I guess it looks great on camera. I only have three real beefs with the movie. First of all, I think the run time of 2 hours for this kind of movie was too long. If they trimmed some of the fat, I'm sure they could have gotten by with 1 and a half hours or maybe 1 hour and 40 minutes long. My patience was wearing thin near the end, I just wanted them to get to the damn tournament. My second gripe is with the chemistry between Jaden and Jackie Chan or the lack thereof. It just didn't feel believable. Their relationship seemed so forced. It was certainly not a Macchio and Morita team up. And finally my last gripe, which isn't really a gripe, but more of a "I wish". Anyhow, I wish they would of used the song "You're the Best Around" in the montage scene just like in the original. I love that song, and I kick off every morning listening to it. But as I said, the movie entertained me (actually, I have no idea how much water that statement holds as I watch and am entertained by DTV movies all the time) and its good and safe fun for the whole family, so in that respect, you can't go wrong. Later geeks!